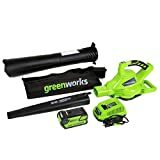 Let’s begin with the WORX TriVac WG505 12 amp All-in-One Electric Blower/Mulcher/Vacuum—the most affordable leaf blower, vacuum, and mulcher on this list.This lawn and garden maintenance tool is more reasonably priced than most of the other similar tools that are upmarket but come with less useful features. This said, we assure you, this leaf blower, vacuum, and mulcher comes with just as many useful features as even the best leaf blower, vacuum, and mulchers currently available in the market that come with heftier price tags. First, and foremost, the WORX TriVac WG505 Electric TriVac Blower/Mulcher/Vacuum comes with a 12-Amp electric motor that enables this leaf blower, vacuum, and mulcher to blow out air at a maximum speed of 210 mph, assuring you that the device can deal with all kinds of debris, even so-called tough debris like matted leaves. If you’d worry that the device will be too much for you to handle, don’t, for it comes with an adjustable air regulator that enables you to reduce the air flow, which not only gives you control over the device, but also allows you to work around delicate plants without making an even bigger mess. The device also comes with a wrap-around, soft-grip handle, which makes handling it even easier. If you’d worry that the motor will make a racket while the device is in use, don’t, because the motor was designed to emit noise at only 70 decibels, which, to be sure, will be tolerable. The rest of the useful features of the leaf blower, vacuum, and mulcher are: switch for converting the device into a leaf blower, a vacuum, or a mulcher and then back again easy; angled tube that enables you to reach hard-to-reach areas like your car’s underside; 16:1 mulch ratio, which means the device can truly mulch debris effectively; ‘collecter bag’ that can be emptied easily by way of a ‘quick-connect coupler’; impeller housing that can be opened by just pushing button, which makes cleaning the leaf blower, vacuum, and mulcher a snap; impeller made of sturdy ABS plastic construction, assuring you that the device will last long; and a full 2-year warranty. Despite the WORX TriVac WG505 Electric TriVac Blower/Mulcher/Vacuum wide array of useful features, a small number of consumers have noted some drawbacks to this leaf blower, vacuum, and mulcher. According to them: the angled tube causes the device to tip backward when in use, making it ineffective as a leaf blower; the vacuum function is ineffective, too; the impeller isn’t really sturdy; the collector bag is difficult to detach; and the customer service is incompetent. Nevertheless, the leaf blower, vacuum, and mulcher received a rating of 4.2 stars out of 5 on Amazon. The WORX WG509 TriVac Blower/Mulcher/Vacuum is, more or less, $30.00 more expensive than the leaf blower, vacuum, and mulcher reviewed previously, so it would only be fair that you expect more from the former. We assure you, this leaf blower, vacuum, and mulcher delivers. To be specific, the WORX WG509 TriVac Blower/Mulcher/Vacuum comes with several useful features that make it a truly effective leaf blower, vacuum, and mulcher that it’s easy and enjoyable to use. These features are: 12 amp electric motor that enables the device to blow out air at adjustable speed of 75 to 210 mph, assuring you that the device can deal with all kinds of debris, even ‘tough debris’ like matted leaves, while emitting less than 71 decibels of noise, which, to be sure, is a tolerable level of noise; flip-switch conversion into all functions of leaf blower vacuum mulcher, making the device truly easy to use; angled tube that enables you to reach hard-to-reach areas like your car’s underside; adjustable air regulator that enables you to reduce the air flow, letting you work around delicate plants without making even a bigger mess; wrap-around, soft-grip handle; 1.2 bushel capacity collector bag with a quick-connect couple; and an impeller housing that comes off at a push of a button. Since all of these features can be found in the leaf blower, vacuum, and mulcher reviewed previously, as well as most of the best leaf blower, vacuum, and mulchers currently available in the market, you might ask yourself, what sets the WORX WG502 TriVac Delux Blower/Mulcher/Vacuum 12.0 Amp with Metal Impeller apart? Well, the leaf blower, vacuum, and mulcher comes with a heavy-duty metal impeller blade, which assures you that this device can last long; and an 18:1 mulch ratio, which makes the device a truly effective mulch-making tool. Although the leaf blower, vacuum, and mulcher comes with a wide array of useful features, some customers have complaints about it. They say that the device isn’t as powerful as expected, isn’t an effective vacuum, and is noisy. They also say that the collector bag isn’t as sturdy as it should be, and the angled tube is too short and will give you the same problem that the angled tube of the leaf blower, vacuum, and mulcher reveiewed previously gives its users. The former, however, received a rating of 3.9 stars out of five on Amazon. The GreenWorks 24322 DigiPro G-MAX 40V Cordless 185MPH Blower/Vac with 4ah Battery and Charger is the most expensive leaf blower, vacuum, and mulcher on this list—and the most useful. Indeed, it comes with a wide array of useful features that can make it go toe to toe with most of the other best leaf blower, vacuum, and mulchers currently available in the market. First, and foremost, the GreenWorks 24322 DigiPro G-MAX 40V Cordless 185MPH Blower/Vac with 4ah Battery and Charger comes with a powerful, rechargeable 40-volt 4Ah battery that enables this leaf blower, vacuum, and mulcher to blow out up to 340 CFM of air at variable speed of up to 185 mph. This motor can also generate 30 percent more torque than those of most of the other leaf blower, vacuum, and mulchers, making the aforementioned leaf blower, vacuum, and mulcher really powerful. To ensure that you’ll be able to handle the device with ease, the device comes with an over-mold grip handle and a wrap-around handle. The rest of the useful features of the leaf blower, vacuum, and mulcher are: simple, quick start-up; snap-on-and-off design that makes converting the device into a leaf blower, a vacuum, and a mulcher a cinch; brushless motor that is not only durable and low maintenance, but also emits low levels of fumes, noise, and vibration; 10:1 mulch ratio LED battery level indicator; no electrical cord that can limit your reach; collector bag; charger; recharge time of only 1 hour; and operator’s manual. The only minor complaint about the WORX WG502 TriVac Delux Blower/Mulcher/Vacuum 12.0 Amp with Metal Impeller is that its charger doesn’t work as well as it should. But most consumers were pleased with their models of this leaf blower, vacuum, and mulcher. Moreover, the device received a rating of 4.1 stars out of 5 on Amazon. It would be a mistake to assume that a low-cost product is low quality. As we hope that the detailed reviews of the 3 of the best leaf blower vacuum mulchers currently available in the market were able to prove to you, an affordable lawn and garden maintenance tool can be just as effective, easy, and enjoyable to use—if not more so—than its pricier, high-end counterparts. Approx. 8 years ago I bought the leaf vac that was on 4 wheels.It wore out last year so I bought your new vertion of it. I must say the quality of the new model sucked. Did not pick up leafs with using your hand to help push them through the end.what a waste of money .To late to take back so bought your new hand held leaf vac.It works. Just wanted to let you know to take the 4wheel vac off the shelf .